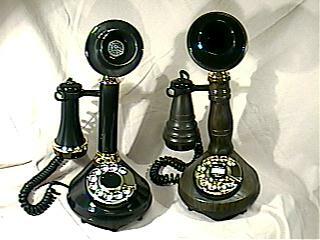 Recollections sells and refurbishes classic telephones, made before the break-up of the Bell System in 1984. In those days, the phone company owned the phones. They were simple and reliable, as any service call cut directly into the phone company's profits. Most of the companies that made these classics have long since stopped making phones, so they are primarily valuable as nostalgic collectibles for display. However, most will still work wonderfully on your current residential hardwired telephone line (whether touchtone or rotary service), sound great, and will likely continue working for years to come. If you have a modern digital phone system or broadband phone service, check to see if it's compatible with "POTS" telephones. The following pages contain a brief sample of some of the more popular phones from my current inventory. There are hundreds of phones in stock, in dozens of different models. Please contact me for specific model availability and pricing, or to request models not on this list. I travel a lot in search of phones, but generally respond to inquiries within a day or two. Phones are all finished to order. It takes a bit more time, but gives you more control over the finished product. Each phone is professionally cleaned, lightly hand polished and tested, unless purchased "as is". The goal is to make the phone presentable while retaining as much of the original finish as possible, so light surface scratches may still be visible if you look closely. This is the same treatment I give phones in my own collection. More vigorous refinishing is available by special request. Price ranges are sometimes given, as phones are found in varying condition, and occasionally with later components. Shipping and taxes are extra. Please send your requirements and I'll respond with the best options from current inventory. Phones may be customized with your choice of cord style and color, and an old fashioned computer-generated number card with your number on it. Ringer boxes are available in oak, walnut, bakelite or plastic -- some with magneto and crank. Special requests are welcome!! I'll even restore your favorite phone. E-mail for details. Why not have Recollections repair or refurb the phone you got at the yard sale, flea market, auction or inherited? 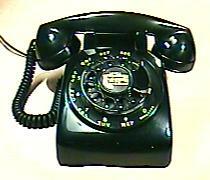 I completely service most residential phones made from the late 20s thru the 80s. 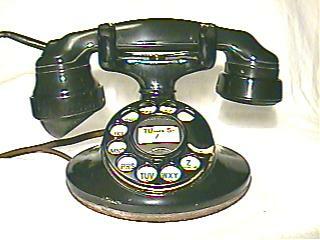 Phones are wonderful gifts or decorative accent pieces for theme rooms. Direct shipment to the recipient is available. Send a card with a personal greeting in your handwriting with your payment, and it will be included in the package. The paid invoice will be sent to you, not the recipient! Notify me in advance, so I can prepare your order. Pay by USPS Money Order or Paypal. Use Priority or Express shipment. Note: you must enter the above address in the email TO: field manually. There are no machine-readable addresses on this site to help reduce the amount of SPAM email.